Discussion in 'Characters & Equipments' started by derek281, Apr 10, 2019. From what I've read, they will come with future events. Most likely from very high difficulty fights though. Got ff7 Ultima Weapon, ff3 eternal staff and ff tactics kiyomori katana...what did everybody else pick? I just picked up a rod for Terra. Probably getting the Type-0 MND dagger and then wait for the elemental artifacts. @Wolf check out my monster contestant now! I grabbed FF9 Sword, FF10 Spear (bad choice, as I dropped Kimahri from my Dream Team) and the FF4 Bow. I'm just holding out until elementals... A lot of people have mentioned the T0 MND dagger though, what's the draw to that exactly? It has the same amount of max MND as other artifacts (like staffs for example) but basically daggers are useable by everyone so you can equip it on your white mages. I mean why people are all choosing that particular one. Also why they aren't just waiting for a holy+ one next wave. One example would be for someone like Beatrix. She can use 6* White Magic, but she can't use Staves/Rods, so that dagger would be perfect for her. If you wanted to turn her into a stronger caster. Would that not be better with a non-RS holy MND dagger from next wave? 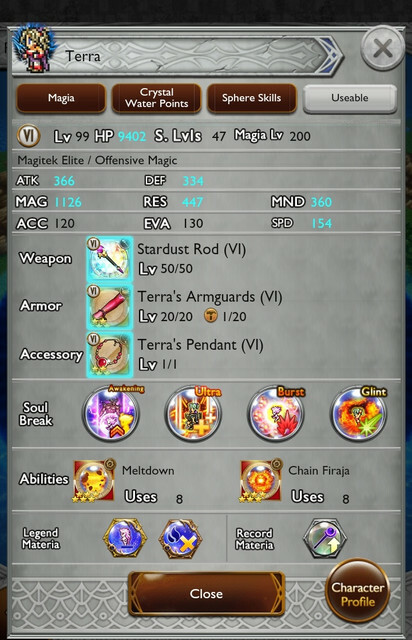 T-0 is the only dagger having MND as it's primary stat so it's great for healers who don't benefit much from a holy+ artifact unless you are casting holy(ja) instead of healing.